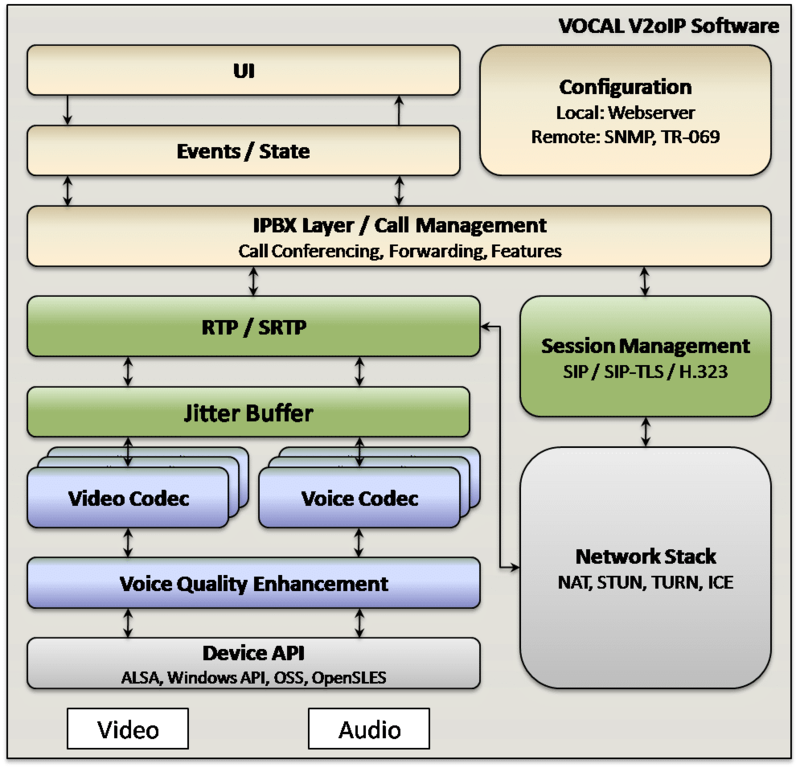 VOCAL’s Voice and Video over Internet Protocol (V2oIP) suite of software libraries provide the foundation for our Video PBX and HD Video Reference Designs which offers licensees complete voice and video solutions. V2oIP applications treat voice, video, data, or facsimile as simple data, which is packetized and then transmitted over IP networks in real-time. Since we provide both the hardware design and optimized software (including our state of the art On-One™ DSP technology), VOCAL can provide unsurpassed advantages in cost and time-to-market potential. Contact us to discuss your voice and video application requirements. The software includes a Network Stack, SIP Stack, full-featured Telephony software, as well as a wide range of VoIP vocoders and video codecs. Together with SRTP, SDES, IPsec, and our encryption libraries, VOCAL’s V2oIP software can ensure privacy and security of all communications. Also present is Quality of Service (QoS) support; efficient prioritization of existing bandwidth to ensure maximal throughput and best possible media quality.